NEW YORK, Nov. 2—At a biker bar in Phoenix, Ariz., a reporter in a navy-blue suit and yellow tie, with side-parted hair and glasses planted on his nose, strode up to one of the beefy regulars and asked the man why he wanted a ban on firearms in bars to be overthrown. Was he, the reporter asked straight-faced, a lunatic? The interview didn’t last long. One minute after lights-camera-action, cameraman and reporter fled the scene, while the well-muscled bar regulars shouted and waved fists. It wasn’t exactly war reporting. Still, pretend reporter Ed Helms has lived through a few such hair-raising moments since April 2002, when he became a correspondent for The Daily Show, a socio-political satire that airs weeknights on Comedy Central. Not only have the show’s ratings skyrocketed over the last 12 months, but the program has become a significant source of political news about the 2004 presidential campaign, especially among younger viewers; in September, the University of Pennsylvania’s National Annenberg Election Survey found that those between the ages of 18 and 34 who tuned in to the show displayed far better political knowledge than viewers who got their news from elsewhere. 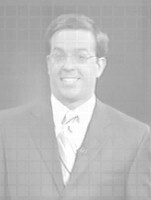 Tonight, with the hotly contested 2004 presidential race drawing to a close, Helms prepared to join fellow correspondents and host Jon Stewart for an extended hour-long program. It’s a natural place for the 29-year-old Atlanta native to be. A long-time standup comic and self-described “political junkie,” Helms said his politics were styled by his politically savvy parents, who served up strong opinions along with food at the family dinner table. (His older brother is a Political Science PhD candidate at the University of Barcelona). “I’ve always dovetailed in that I was just interested in creating and generating comedy in various ways,” explained Helms, who was picked as correspondent from a pool of 300 applicants. Prior to that, his acting experience was limited to comedy clubs and voiceovers for advertisers such as Burger King, Doritos and Sharp Television. A prerequisite for the correspondent position was a healthy dose of humor, something that has never been a problem for Helms. Comedy was second nature to him. He performed stand-up, improv and sketch comedy throughout his college years, during summers spent in New York and when moving to the city since after graduation. He still performs every Friday night at the Underground, a bar and comedy club at the corner of 107th Street and Broadway. musical tunes resonated through the halls of their alma mater, Oberlin College in Ohio. proclaims its self to be source for fake news. It also won the Peabody award for Indecision 2000, its coverage of the last presidential election. This year’s election coverage has been dubbed Indecision 2004. Ed Helms spent A large part of his hour-long stand-up comedy show Wednesday night at Mohegan Sun's Cabaret talking about awkward moments in his life. Like the time when he was 8 years old and provided baton twirling entertainment at his brother's 11th birthday party — and was later beaten up. And the time he ran through the subway station to make his train and hung on to the overhead strap trying to catch his breath only to realize that the doors stayed open for another five minutes. Maybe Helms can incorporate Wednesday's show into his next routine. “People usually find my pain funny,'' he said, addressing the 150 or so folks who sparingly laughed at his self-deprecating jokes and barely found the energy to smile at his sarcastic humor. The funny thing is, that remark elicited one of the loudest laughs of the night. Helms, the fake newsman from Comedy Central's “The Daily Show,'' opened the first of a four-night engagement at the Cabaret Theater looking more casual than his suited television persona, in jeans and a blue and white tattersall shirt. Helms did his best to coax a reaction out of the half-filled theater. He tried to talk to a woman in the audience, only to be put on proverbial hold while she answered her cell phone. During a bit about karaoke singers, he was heckled by workers from a karaoke bar who happened to be celebrating a birthday in the back of the theater. “Give me something, people,'' he quipped during one uncomfortable silence. Helms scored a few guffaws when he poked fun at the casino, calling it a bio-dome that could sustain life for eons. He also suggested the Mohegans descended from aliens — pointing out pod-like light fixtures — and said the casino looked like a docking area waiting for the mother ship to return. Helms was a little slow on his timing, and he checked his watch at least twice during the show. But Wednesday is a harsh night for comedy. Even in the best clubs in New York City, the midweek crowd is tough to crack. Albanese did his best to warm up the audience with some astute observations on language, like suggesting the word “landlord” be stricken from the English language. “No one should have lord in their name,'' he said. The two return to the Cabaret for shows at 7:30 tonight and 7 and 10 p.m. Saturday. Tickets are $25 at the Cabaret box office or Ticketmaster .com or by calling 860-886-0070. IF you adore guilty-pleasure shows like VH1's "Behind the Music," "The Fabulous Life" or "Best Week Ever," get ready for a reality check. You know those fast-talking commentators who wittily expound on the trials and vices of your favorite celebrities? Most of them are faking it. And a smart new show, called "The Name of This Play Is Talking Heads," is exposing the way TV commentators are spoon-fed their lines and jokes. I've been there. I once participated in an episode of "The Fabulous Life" about Cameron Diaz (news). The producer asked questions like, "Wouldn't you say Cameron has a real knack for combining high and low fashion?" and I was expected to parrot back, bubbling with enthusiasm, "Cameron has such a knack for combining high and low fashion!!" Although I didn't cooperate, I was invited to do more shows, but declined. It was a series of similar experiences that prompted Marc Spitz, a senior writer at Spin magazine, to write his play, a 45-minute, five-man production playing at the intimate Under St. Marks Theater in the East Village. The play deals with the travails of Pete, a writer at "Headphones" magazine who is invited by an unnamed music channel to record some segments for a show called "The 100 Most Rockatrocious Moments." "These shows are evil," says Spitz. "They're like a virus in the culture. When I started doing them to promote magazine pieces, they were a bit more sincere. But they've gotten worse." Spitz finally lost his cool after doing a show on Axl Rose (news). "They kept asking me, 'But Axl Rose was crazy, huh? He started a riot and went nuts on his supermodel girlfriend, didn't he?' It was like they were throwing bait at me, and I wouldn't say what they wanted me to say and I just walked out. "But," he adds, "they make you sign a release, so they can keep using your most embarrassing clips forever. It's like posing for glamour shots at 18 and seeing them run it again and again." Parts of Spitz's play are true, acknowledged Michael Hirschorn, a vice president at MTV who has seen the show — but "parts are ridiculous," he said. "All production involves some kind of steering and coaching, but we love to have a wide variety of opinions. Are we into fascist mind control? No. But you have to articulate things in certain ways to make them make sense on TV." "You end up looking like an idiot." Sarah Lewitinn, a colleague of Spitz's at Spin Magazine who used to work at VH1 and saw the show on Saturday night, said, "It's not always like that — sometimes they let you ad-lib. But there was this one time when I had to go in to do 'Awesomely Bad Hair,' and they had me talk about people I have never seen or heard of in my life." So why does she appear in them? "It gives my mom a kick," she says. "The Name of This Play Is Talking Heads," at the Under St. Marks Theater, 94 St. Marks Place (between First Avenue and Avenue A). Thursdays and Fridays at 8 p.m., and Saturdays at 8 and 10 p.m., through 26 March. Tickets: $15. Well, months later, and I finally remembered the logon information for this blog. Sorry. Scores of people flooded West Hall on a particularly cold Friday night to see Comedy Central’s Ed Helms give his two cents on the RPI handbook, his childhood, and the 2004 presidential campaign. While at times only getting obligatory chuckles from a glad-to-be-indoors audience, it was an enjoyable performance overall. The show opened with the “raffling” of the front row seats of the West Hall auditorium by a Diversity Week staffer. After attempting to wring answers from the audience to questions about Ed Helms’ life, he finally gave away the seats to the first handful of people to wave their driver’s licenses in the air. He then delved into the humorous, albeit painful, portions of his childhood, noting how his brother derived pleasure from his continual agony, and an embarrassing episode involving his aspirations to become a professional baton twirler. Recalling that incident, he quoted his father as saying, “Son, you have a natural gift as a baton twirler. If you ever do that again, I’ll beat you.” He also pointed to that event as his inspiration for stand up comedy. As a correspondent for Comedy Central’s The Daily Show with Jon Stewart, Helms naturally made some cracks at politics, pointing to the presidential debates and Howard Dean’s failed candidacy. He also took questions from the audience, stating that he usually gets asked questions concerning his sexual orientation (later professing to be “straight”). He was asked why he was there, to which Helms replied, simply, “cash.” When asked by an audience member for one of the breath mints that had been supplied to Helms, he threw the bowl of mints into the crowd. The show closed with a venture into the world of Yanni, where he asked the sound crew to play a CD by the Greek artist, and offered narration. He then described a Yanni fantasy, where he was on the hood of a white Camaro, and Yanni was driving, taking the audience off a cliff, only to be saved by two flying Pegasii. Overall, it was a well-received performance, though at times Helms appeared rusty with his standup routine. Surprisingly, he did not use very much (if any at all) material from The Daily Show, which might have bolstered the performance. It was still nice, however, to get a chance to chuckle after a grueling first week of classes. I don't understand why people go to Ed's shows thinking he's going to read off the same teleprompter that he reads off at TDS. They expect him to sit down and do the same thing he did on the show the month before or something. "Just try to edit everything I said down so I sound smart."